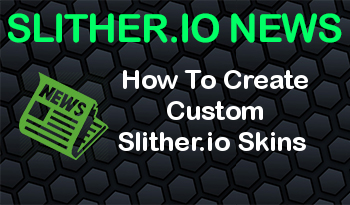 As everyone playing this game you can design your own snake in slither.io.First, we need to download slithere mods from google chrome store or slithere.com which has tampermonkey and chrome webstore types. Second, you need to disable all other add-ons on slither.io After installing the slitherplus mods.You will see the create or change skin type button below the screen on the left after running the mods.In addition, in the form of graphics settings need to be optimized to work properly. You will see 3 options that are Change Skins (W key), Skin Rotator, Create Your Skins.We briefly describe them.Change Skins (W key) shows skins which are pre-prepared in the mod.Skin Rotator sets the speed of change skins in the mod.In addition, do not forget to tick Change Skins.Create Your Skins helps you creating custom skins according the your wishes. We click Create Your Skins button and then opening the snake settings part.In this section, you can change the snake colors by clicking on the color box.If you want to increase the number of colors on the snake, you may click add color stop button.You can add up how much color you want.Cell numbers adjust the color range on the snake.We usually recommend 7 cells because colors look better.